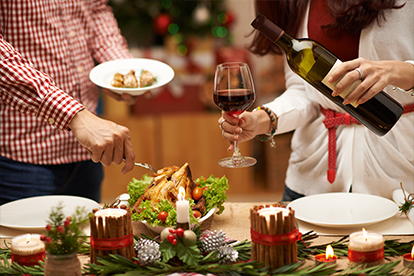 The holidays have come and gone and you might be feeling a little icky after all of the decadent dishes, desserts and drinks. It is okay to treat yourself but now is the time to detox and dive into a new eating and exercise routine! Drink more water. If you’ve been traveling or drinking a lot, you are probably dehydrated even if you’ve been drinking water regularly. Now is the time to drink more water. Aim to drink half of your body weight in ounces of water every day. If you have trouble drinking that much water, add fresh fruits or vegetables to naturally flavor the water and help you to drink more. Try eating more raw foods to give your digestion a break. You don’t need to eat an all raw food diet, just incorporate more into your diet for a while. Think fresh fruits, veggies, nuts, seeds, herbs and spices. The fresh nutrients will absorb quickly in your body and can help you detox from all of those holiday goodies. Reduce your acid levels to improve your energy, reduce inflammation and balance pH levels that might be off if you’ve been indulging in dairy, bread, alcohol, processed foods and sugar. Focus on raw foods, Kombucha and add lemon to your water in the morning to balance your acid levels. Start hitting the treadmill and weight room. More cardio and lifting weights will not only help you lose any pounds you put on during the holidays but it will help you de-stress and recharge. HIIT (high intensity interval training) are also a great and quick workout for this time of year. Last but not least, go for more walks and rest! If you’ve been super busy during the holidays, you might need more downtime and sleep. Walking for about 30-minutes after dinner can help you digest and relax before bed and get that restorative sleep you need. If you’ve been prioritizing everyone else and have been busy every night with holiday hoopla, now is the time to prioritize you! Get a massage, take a bath or do an activity you enjoy to de-stress and get back into a calmer state of mind. Did you indulge a little too much this holiday season? What do you do to bounce back? Share with us!